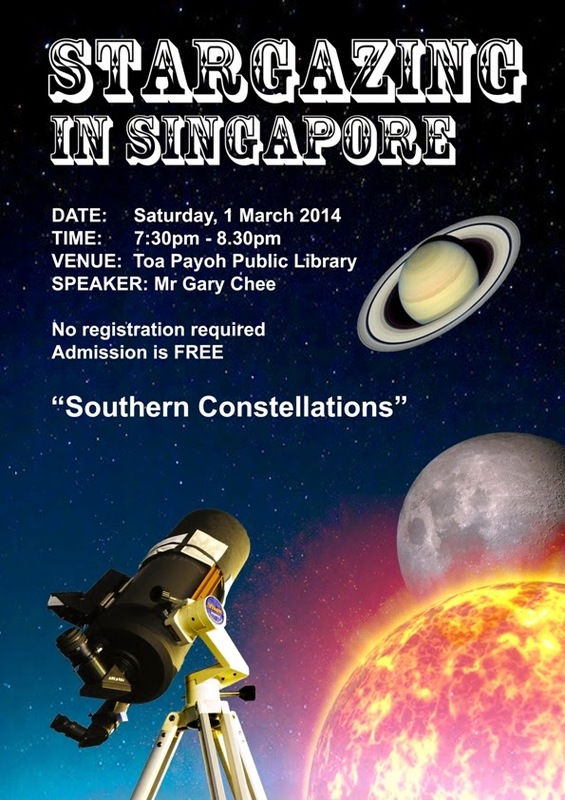 The next public stargazing talk is titled "The Southern Constellations". Venue: Toa Payoh Public Library. Level 1 Programme Zone. Admission is free. No pre-registration required. Late-comers welcomed! Learn about the beautiful constellations in the southern sky and the cosmic "treasures" in them! Weather permitting, live stargazing during/after the talk. Come see Jupiter, star clusters and nebula (star cloud) through telescopes! This is my video of Neil deGrasse Tyson's Q&A session with children at Jurong Regional Library. Though the event was meant for children, I am very sure many adults will benefit from the wisdom shared and Neil's charismatic presentation style. Especially science educators in Singapore looking for ideas to engage young students. For example, how to explain a seemingly complex subject like parallax error to kids in a fun way. Now that these videos are completed, can't wait to start blogging about the events of that magical 2 days in February 2014. For the rest of 2014, or perhaps for many years to come, nothing will beat what I had experienced last week on 13th and 14th of February. I will definitely write a long blog (or mulit-part blog) about that experience and insights gained from interacting with Dr Neil deGrasse Tyson and Miss Ann Druyan. This will take sometime as my working schedule seems to get more and more busy as more and more interesting astronomical events are happening since the year started. So in the meantime, enjoy watching my 46-minute video of the Q&A session conducted at National University of Singapore (Faculty of Science, LT27). Apologies for the camera auto-focusing problems in the first 11 minutes of the video. Dr Neil deGrasse Tyson and Ann Druyan in Singapore! Dr Neil deGrasse Tyson and Ann Druyan will be visiting Singapore from 13 - 14 Feb 2014 to promote the epic upcoming TV series - COSMOS: A Spacetime Odyssey!! Premiering on 9 March 2014 in US, 15 March in Singapore, this 13-part series will be shown on National Geographic Channel. Watch this recent interview by Bill Moyers and you will be a fan! And join the 1.64 million people that are following him on Twitter @neiltyson! And since Valentine's Day is this coming Friday, this is a nice video by Milky Way Musings to find out who is Ann Druyan! Big thanks to the kind invitation by Fox International Channels (Singapore), I am extremely honoured to get a chance to participate in these COSMOS-related events for the next 2 days. Neil and Ann will be attending a press connference, question-and-answer session at National University of Singapore (Faculty of Science) and a light-hearted interaction with children at Jurong Regional Library! Please take note these events are not open to walk-in public. For the latest news on about these events, please search for the official Twitter hashtag #COSMOSSG. I will be providing event updates via my Twitter account @astrosg. There will be exclusive autographed photo prints of Neil and Ann to be given away as prizes! So follow my tweets to find out how to win them! Ok. Now you can continue to Google/YouTube search on these two amazing souls! The next public stargazing talk is titled "How to Choose a Telescope and Binocular".